A fully automated packing process has fundamentally changed the logistics processes at one of CSi’s leading customers. A custom-built, fully automatic robot system was designed and installed which is unique in the small parts industry and also unique in other sectors. 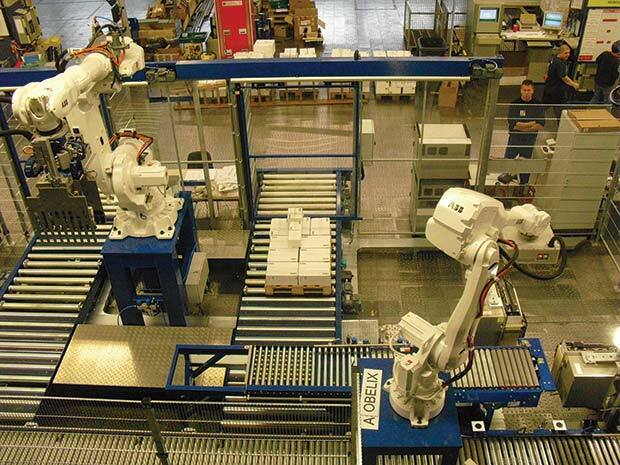 The system utilises two robots that have replaced the manual packing functions previously carried out by several people, over multiple shifts. The smaller of the two robots takes packs out of the transport bin, whilst the other robot stacks it onto the pallet. These new “colleagues” were named “Asterix” and “Obelix”. The idea of automating the packing process came up a few years ago, when the order-picking department introduced a fully automated storage system upstream. The old packing process required the packer not only to create the most stable stacking pattern, but they also had to sort the articles according to the customer’s exact requirements, by hand! This picking and palletising process has now been fully automated. By using a series of complex algorithms the system is able analyse customer orders and sequence the automated feed system to allow the robots to create stable pallets of products, packed in exactly the correct order. The carefully designed process ensures that the right product arrives at the right time so that “Asterix”, the picking robot and “Obelix”, the palletising robot, produce perfect pallets. Creating this system involved a detailed analysis of the order data provided by the customer and then breaking this information down to enable the process to be simplified, and only then fully automated. An essential goal of every automating project is to define the process as simply and clearly as possible – so that a robot can “understand” it. Complexity should be minimised, but without compromising the customer’s quality of delivery and the services that they provide to their customers. Case weighing and checking performed up-stream catch out-of-spec boxes and sends them to the reject area to be processed. The change over from the old system to the new was achieved during production hours – a bit like “open heart surgery”, during which time customer deliveries were maintained and were on time! A previously expensive packing process is now smooth, accurate and minimises product damage.